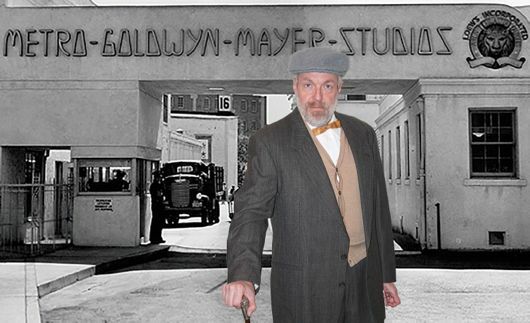 MadKap Production's new play, Mr. Shaw Goes to Hollywood, is a bit of Hollywood fluff leavened with the wit of George Bernard Shaw, who probably was and certainly considered himself "the world's greatest playwright." This is a smart, funny play set in 1933, with lots of celebrity name-dropping and appearances by Shaw and Clark Gable, among others. The 130-minute production (with one intermission) plays out in 24 short scenes, broken by blackouts; director John Nasca does an excellent job of pacing his actors. The 1930s music before the play and at intermission enhances the mood. Playwright Mark Saltzman started out writing Sesame Street sketches for The Muppets and went on to write for television, movies and theater. His Author's Notes in the playbill describe how a news photo inspired this play about one day in Hollywood. The photo taken in March 1933 shows four glum-looking people at a luncheon table: Shaw, actress Marion Davies, movie mogul Louis B. Mayer, and Clark Gable. Saltzman says they look "as if they're having the worst day of their lives." The play begins with Shaw (Bill Chamberlain) and his wife Charlotte (a charming performance by Anita Kallen) arriving on the shores of Malibu, headed for Culver City for a luncheon on the MGM lot. They finally arrive after a series of transportation mishaps. The luncheon guests all have their own interests in meeting Shaw; they each hope to persuade him to grant the rights to one of his plays for Hollywood production. Shaw has never done this and although he would like very much to earn Hollywood money, he will only allow one of his plays to be made into a film if he has total artistic control. Mayer pronounces that an impossibility. Hearst wants Shaw to grant the rights to Pygmalion so that Davies (practicing the cockney accent) can play Eliza Doolittle. Mayer wants the film to feature his current box-office star, Norma Shearer. Barrymore wants to play Shaw's The Devil's Disciple. Gable is only there by accident--but Mayer takes the opportunity to berate Gable about his affair with Joan Crawford. Horse trading ensues between Mayer and Hearst, whose newspapers employ the celebrity gossip columnist Louella Parsons. Jonathan Helvey does a clever job of playing Oscar, Davies' resourceful houseboy, who wants to be in the movies too. The Greenhouse Theater's small studio has a cramped performing space. Slide projections are used to define scene changes, but the play and its subject matter really deserve a more lavish production. The only real Hollywood touch is the blonde Marion Davies strutting around in her bustier and high heels for most of the play. George Bernard Shaw wrote magnificent plays of substance and controversy--like Mrs. Warren's Profession, a story about the brothel business; Major Barbara, a play about charity and the armaments industry; and The Doctor's Dilemma, a story about the ethics of medical treatment. In the Saltzman play, Shaw calls Pygmalion "a phonetic potboiler... it's always Pygmalion they want to desecrate." Later he observes that a crazy New York producer wants to turn it into a musical. Since Shaw's death in 1950, his "potboiler" has had a long and successful history in its musical form, My Fair Lady, on both stage and screen; critics have called it "the perfect musical." Mr. Shaw Goes to Hollywood runs through February 16 in the second floor studio at the Greenhouse Theater Center, 2257 N. Lincoln Ave. Performances are Thursdays through Saturdays at 7:30pm and Sundays at 2:30pm. Tickets are $35 and can be purchased online or by calling 773-404-7336. For more information about the play, visit MadKap's website. Great review and exactly what I think. A very fun, fast moving play. Mrs. GBS was particularly good and charming.